Dryness is an equal-opportunity skin harasser. It doesn’t care about your age, skin type, or ethnicity — it chooses its victims seemingly at random. However, dig a little deeper and you’ll find that there is some method to the madness. “Dry skin can be genetic, but there are also other factors that contribute, like not drinking enough water, certain medications, using a cleanser that strips the skin of necessary oils, and dry air,” explains Angela Kim, founder of Korean natural beauty brand Savor Beauty. And despite what’s causing it, all of these factors lead to the same problems: flaking, scales, redness, roughness, and itchiness. “When we don’t treat dryness ​we can thicken skin texture and cause scaling, often accentuating fine lines, wrinkles, and redness that may otherwise not be​ ​that noticeable,” explains Dr. Loretta Ciraldo, MD FAAD. And, while you can’t avoid the genetics issue (thanks, Mom and Dad), there is something you can do about the rest of those factors Kim mentioned. Ahead, we’ve put together your must-read guide on keeping dryness away, from your head to your toes. From hydrating best practices to ingredients and products you need to try, here’s everything you need to know about getting soft, smooth skin. It stands to reason that if your body is dehydrated, your skin will be, too. So be sure to incorporate lots of water into your everyday diet, be it foods with high-water content or drinking at least eight glasses of good ‘ol H2O a day. For the body, Dr. Ciraldo blames lye-based soaps and artificially-fragranced body washes and lotions. On her no-go list of ingredients are sulfates; sodium laureth sulfate (SLS); artificial fragrances, dyes, & color; ethyl alcohol; parabens; ​formaldehydes; phthalates; coal tar; hydroquinone; triclosan, ​and ​triclocarban. If your skin is especially prone to dryness, be sure to thoroughly scrutinize the back of every skincare bottle, jar, and tube — you want to make sure these ingredients aren’t in there before investing! It can be especially tricky to find soaps that are free of SLS, but body cleansers like SheaMoisture African Black Soap Body Wash ($6) forego the stripping ingredient and instead uses traditional African Black Soap — a cleansing ingredient of almost mythical proportions — alongside aloe, shea butter, sandalwood, vitamin E, and dead sea salt to create an ultra-gentle clarifier that gives you a clean and refreshed feel. Once you’ve kicked those drying ingredients to the curb, gather up products that include beneficial extracts that are known to moisturize. These ingredients will fall into two categories: occlusive and humectant. Occlusives act as a sealing layer to trap existing moisture in the skin and include ingredients like lanolin, allantoin, shea butter, and oils (jojoba, olive, coconut, sunflower, and others). Find them in the Honest Company® Face & Body Lotion ($10), which relies on shea butter and skin-friendly oils — apricot kernel, jojoba, evening primrose, and olive — to give it its moisturizing mojo. Bonus: It’s also safe to use on your face. Conversely, humectants draw water into the skin and include molecules like glycerin, hyaluronic acid, and sodium hyaluronate. For Dr. Ciraldo’s signature line, she turned to bio-identical skin lipids for her Dr. Loretta Intense Replenishing Serum ($70) — they provide an instant moisture boost and leave skin feeling silky. Layering products that contain both types of ingredients is a great skincare strategy — but knowing the right order is essential (we’ll touch on that later). Dead skin cells aren’t just an issue for acne-prone skin — everyone, no matter your skin type, needs to clear away that build-up. Exfoliating with chemical (acids) and physical (scrubs) products will remove the dead skin that makes your complexion look dull and feel rough and scaly. However, caution both Dr. Ciraldo and Kim, it’s all too easy to over-exfoliate, so tread lightly. “Exfoliation is a double-edged sword because it removes the dry​, ​dead surface skin cells,” notes Dr. Ciraldo, “but it also removes​ the moisture-trapping skin lipids​ that are found in the spaces between these cells​.” Go easy on the dead-skin removal and be sure to balance out the exfoliation with moisture-replenishing lotions and creams. 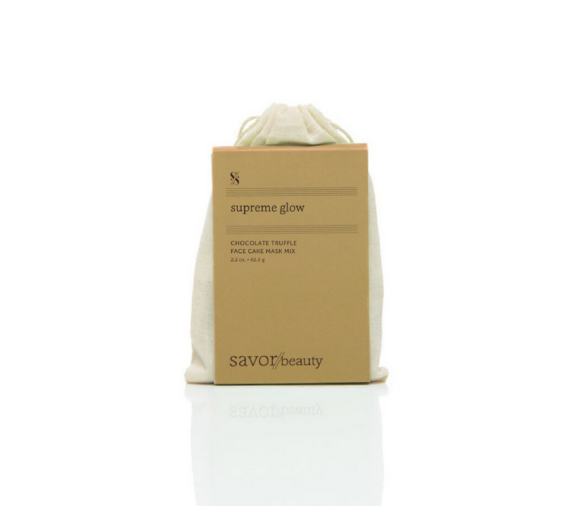 Another option is to seek out treatments that combine hydration with pore-clearing properties, like Savor Beauty Chocolate Truffle Face Cake Mask ($35). A potent mixture of Dutch cocoa, Moroccan lava clay, and buttermilk eliminates dirt and debris as it hydrates, creating a clear, luminous look that will make you wonder why you didn’t slather chocolate on your face sooner. On a similar note, you need to be careful with how you battle your breakouts. We know, we know: The last thing you want to do is treat those vindictive clogged pores with kid gloves. But overdoing it with the acids and exfoliators can actually lead to more breakouts — including those pimples in unusual places. “Many acne sufferers believe it's healthy to ​use very ​dry​ing products on ​their skin,” explains Dr. Ciraldo, “but the drying effects often make the skin overcompensate with more oil production and worse breakouts.” Kim recommends trying gentle detoxifying ingredients like aloe and ginseng instead. (Learn more about skincare infused with ginseng here.) We also like antibacterial honey and toning witch hazel. And, interestingly enough, turns out zinc is also a great, gentle skin clarifier. Try it in La Roche-Posay® Effaclar Gel Cleanser ($15). If you can’t bear to part with your beloved skincare acids, good news: Kim allows that they are still OK, provided you use them on a less frequent basis. She opts for a monthly peel to get rid of dead skin build-up and leave her complexion smooth and clear. Now that you’ve locked down your soft-skin essentials, optimize your hydration with this hack, courtesy of Dr. Ciraldo. “When showering, only use tepid water, as hot water will dry out your skin,” she says. “Once out of the shower, apply moisture-trapping serums and lotions while skin is still a bit damp for enhanced penetration and effectiveness.” Another trick we love for excessively dry skin is to layer our moisturizers — we apply our humectant product (usually a lightweight lotion or serum) then follow that with our heavier occlusive one to seal in hydration. The result is a double whammy of moisture that will quench the thirst of any parched complexion.